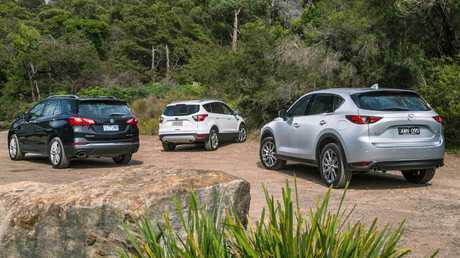 BUYERS who deserted the Aussie six-cylinder sedan for a mid-sized SUV had to settle for substantially less power than they were used to. Things have changed lately, as more makers are turbocharging family SUVs and producing outputs that match or better the trusty old Commodore and Falcon. 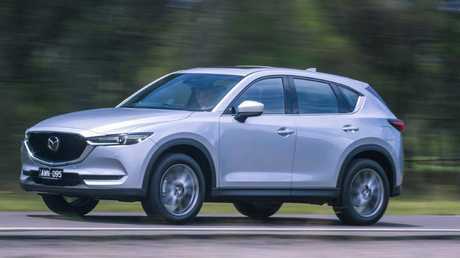 The latest to join the party is Mazda's CX-5. We've pitted it against Ford's Escape and Holden's Equinox to see which one has bragging rights under the bonnet. Ford's EcoBoost four-cylinder turbo originally appeared in the Falcon in 2012 as an alternative to the locally built 4.0-litre six. In the Escape, it is available in all but the cheapest model and is matched to a six-speed automatic. It is the quietest and feels the most refined of the three engines here but can't quite match the acceleration of the Mazda and Holden. The auto isn't as intuitive and quick shifting as the other two, also blunting performance slightly. The Escape is a capable performer on a twisty road, however, disguising its weight and high centre of gravity. The steering is sharper than the Equinox and it soaks up bumps well at speed. The trade-off for that control is a slightly lumpier ride at slow speeds. The Escape is getting quite long in the tooth - this model essentially debuted as the Kuga in 2013 - and the interior looks dated. 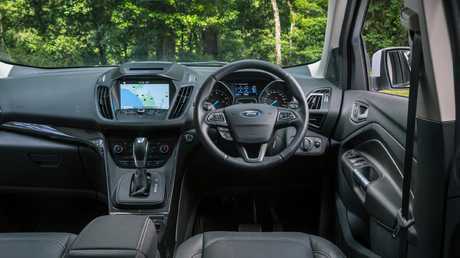 There are no gripes with the quality of the materials, the updated infotainment is among the most user-friendly available but the dash layout is fussy and cluttered and there are some hard shiny plastics. There are 12V outlets in the front, back and load area, as well as two USB outlets in the front. Storage space is generous and there are fold-down tray tables and air vents for the kids in the back. The cabin is roomy but there are no levers for dropping the rear seats from the load area. Standard safety gear is a bit skinny, running to autonomous emergency braking, blind spot alert and rear cross traffic alert but an extra $800 buys you adaptive cruise control, auto dipping high-beams, high-speed AEB and lane-keep assist. The car will also dial triple-0 after an accident and you can program a key for younger drivers that limits top speed and radio volume. In typical American fashion, the Equinox is the "works burger" of this trio: more power, more space and more gadgets. The 2.0-litre turbo feels quickest off the mark, thanks in part to the quick-shifting nine-speed auto. It's a little raucous compared to the Escape but delivers the kind of overtaking response Commodore drivers are used to. Claimed fuel consumption of 8.2L/100km is on par with the Mazda and better than the Ford's 8.6L but none of these will do anywhere near that in the city. Expect low to mid-teens. The Equinox is a little softer sprung than the Escape so there's more pitching under brakes and lean through corners but it still feels composed and capable. Around town, it is better than the Ford at dealing with road imperfections but has an awful turning circle. Inside, the Equinox looks more modern than the Escape but can't match the quality look and feel of the Mazda. The plastics feel harder, the panels don't meet up as precisely and the doors don't close with the reassuring "thunk" of the Mazda. If you can get past that, there are a lot of rewards. The centre screen is bigger than the Mazda and there are enough power outlets to satisfy the most tech-hungry families. There's a wireless charger for compatible phones and we counted four USB and three 12V outlets, as well as a standard household wall socket to plug in the laptop. As with the Ford, it will park itself. The front and rear seats are heated and cooled, the centre console bin is huge, there are acres of space in the back pews and the sizeable luggage area has underfloor storage for valuables. Standard safety equipment includes AEB, rear cross traffic alert, blind spot alert and lane keep assist. Active cruise, standard on the Mazda and optional on the Ford, isn't available and the AEB works only at city speeds. Mazda's turbo is down on power but makes up for that with roughly 20 per cent more torque than the Holden and Ford. Performance is strong off the mark and even stronger when overtaking, although it can get a little gruff under full throttle. On the road, the Mazda has the best compromise between comfort and cornering ability. The suspension is firm but doesn't jar over bumps and corrugations. At speed the steering is precise, it sits flat through corners and it recovers quickly after bigger bumps. The cabin of the Mazda feels like a step up in class. The attention to detail extends to padding on the centre console where drivers are likely to rest their knees. The cabin materials are softer, there are woodgrain highlights on the doors and dash and the knobs and dials have a quality feel. It is the only one of these three to have a head-up display on the windscreen, allowing you to look at your speed, the prevailing speed limit and satnav directions without lowering your field of vision. The blind spot warning will also flash on the windscreen when activated. For all that, the Mazda's not perfect. The centre screen is small and no bigger than those on cheaper Mazdas, while the display in front of the driver remains all old-school dials. There are no USB or 12V outlets for rear passengers but two of each in the front and a 12-volt in the load area. The Mazda's sunroof covers the front seats only while the others extend to the back row. There's also less real estate in the second rear, although quick release levers in the load area make it easy to fold the second-row seats flat. The Mazda has the best standard safety, including active cruise control, AEB that operates at highway speeds and LED headlights that dip to avoid dazzling other cars. Its rear cross traffic alert will slam on the brakes if it detects an object in its path. The Escape has aged well but falls short in cabin presentation. 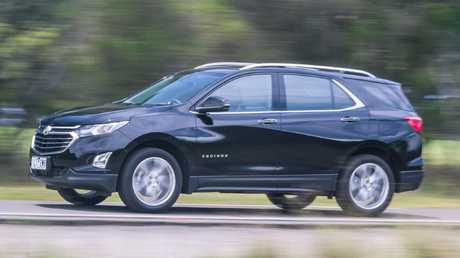 It's shaded by the Equinox, which has better performance, more gear and a more modern cabin. But the Mazda wins because it drives better, looks better and has more advanced standard safety tech. 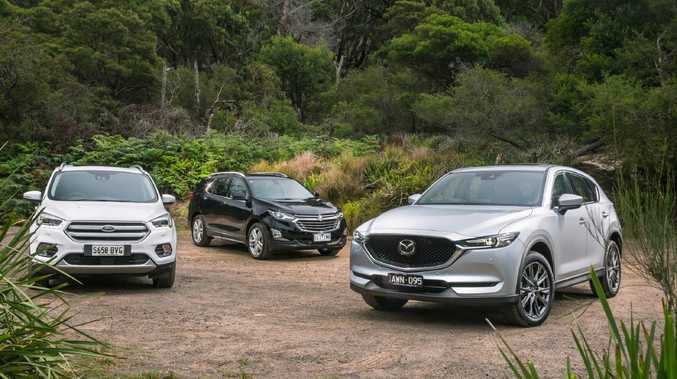 The Mazda is the best car at the full drive-away price but Holden and Ford routinely offer deep discounts worth thousands of dollars on the Equinox and Escape. 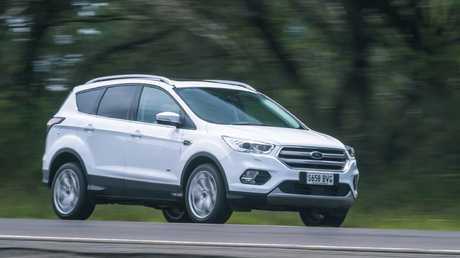 In January, Holden had 2018-plate Equinoxes for $46,290 drive-away and Ford had the Escape Titanium for $45,340 drive-away. Mazda has an unspecified bonus on 2018 models. At those prices, it's a different ball game. Safety: 5 stars, 6 airbags, AEB, lane keep assist, active cruise, auto high-beam, blind spot alert, rear cross traffic alert.